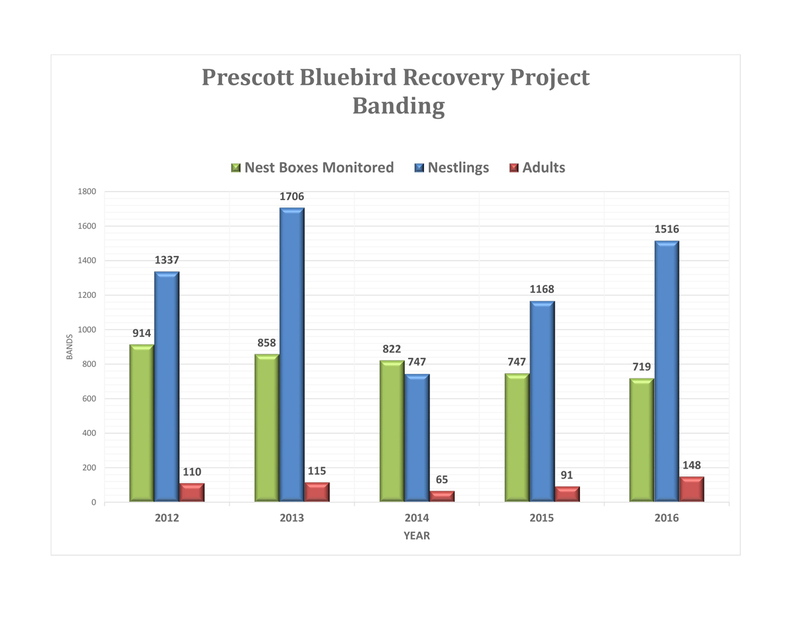 The Prescott Bluebird Recovery Project is a 501 (c)(3) nonprofit volunteer organization dedicated to the recovery, restoration, and enhancement of the Western Bluebird. The Western Bluebird is listed as a “sensitive species” in Oregon by the Oregon Department of Fish & Wildlife. Since the 1970’s the PBRP has been working to help restore the Western Bluebird in portions of Clackamas, Marion, Multnomah, Washington, and Yamhill counties. Click for map of monitored areas. The major reasons for the decline of the Western Bluebird are: loss of habitat; competition from non-native house sparrows and starlings; and reduction of insects due to the use of pesticides. Hubert Prescott was born in February 1899 on a farm on the Nehalem River near Jewell, Oregon. He loved bluebirds as a child, and while they had been very common in the 1940’s by the time he had retired in 1965, they had almost completely disappeared from the northern Willamette Valley. In 1971 after six years of searching the area he finally found a pair nesting in an old nestbox on Chehalem Mountain. In talking with the landowner he found there were about a dozen pairs nesting in the area all in old nestboxes people had on their property. He spent many hours researching and watching the bluebirds. Then he began building nest boxes, experimenting with box size and nestbox hole size. He approached landowners in the area and explained his interest in helping restore the Western Bluebird to its former habitat. 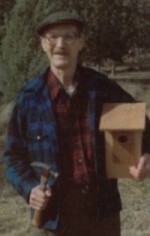 By 1975 he had installed nestboxes on Chehalem, Parrett, Cooper and Bull Mountain areas, the West Hills of Portland; and the Molalla, Colton and West Linn-Stafford areas. 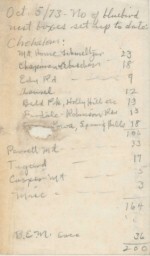 It became impossible for him to monitor and maintain all the boxes so he enlisted the help of the Portland Audubon Society and other volunteers. 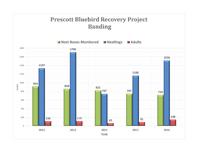 The Prescott Bluebird Recovery Program is based on the work of Mr Prescott, the volunteers who helped him, and those that carried on his work. Nest Boxes: Volunteers place and monitor nest boxes (constructed to the PBRP’s specifications) in appropriate habitat which meets the needs of the bluebirds and where pesticides are not generally used. The boxes are monitored to guard against the non-native European House Sparrows which are small enough to access the nest boxes. Click here for 5 years of banding statistics. Education: Volunteers help educate landowners and the general public about the threats to the Bluebird, write articles for newspapers, offer training classes, make presentations, and lead field trips. The Bluebird Festival is held annually in June by Champoeg State Heritage Area near Newberg. We are making a difference. Since reaching an all-time low in the 1970’s, the Western Bluebird population in the northern Willamette Valley has increased in numbers due in large part to the dedication of our volunteers.